Home Letter of Credit Fees How Much Does It Cost to Open a Letter of Credit? How Much Does It Cost to Open a Letter of Credit? How much are the typical letter of credit opening costs for importers? On this page, I will try to explain the letter of credit issuance costs, and the main factors that are effecting them. Letter of credit is a secure payment method comparing to other payment options in international trade. However, letter of credit has one clear disadvantage. It is expensive. There are multiple banks in action in a letter of credit transaction, and each bank demands a fee for its each action. Letter of Credit Issuance Fee: This is the amount demanded by the issuing bank to open a letter of credit. Advising Fee: A type of letter of credit fee, which is demanded by the advising bank to advise the credit to the beneficiary. Discrepancy Fee: The issuing bank discount a certain sum of money from the proceeds of the letter of credit, if the beneficiary has presented discrepant documents. Confirmation Fee: This is the fee, that is taken by the confirming bank to adding its confirmation to the credit. Amendment Fee: If the letter of credit is amended, the issuing bank and/or the confirming bank may demand amendment fees. Handling Fee: Handling fees are collected by banks for a variety of reasons, such as sending swift messages, holding documents, set of photocopy documents not presented etc. Reimbursement Fee: Reimbursement bank’s fee to settle the credit amount between issuing bank and the confirming bank or the nominated bank. Letter of credit opening cost change case per case, as the costs associated with the letter of credit issuance are effected from various factors. What are the Main Factors Effecting Letter of Credit Issuance Costs? Issuing Bank Charges: Issuing a letter of credit is a commercial act and banks open L/Cs in order to make profit. Letter of Credit Amount: Banks determine letter of credit issuance charges in percentage of the letter of credit amount. Higher the L/C amounts, higher the charges. How Letter of Credit is Financed? Importers can finance the letter of credit amount either via cash or trade finance loans. Cash backed letter of credit is expected to be cheaper than the loan backed letter of credit. Payment Term: As the payment period is getting longer, the letter of credit issuance fees are getting higher. The longer the payment due, higher the fees. 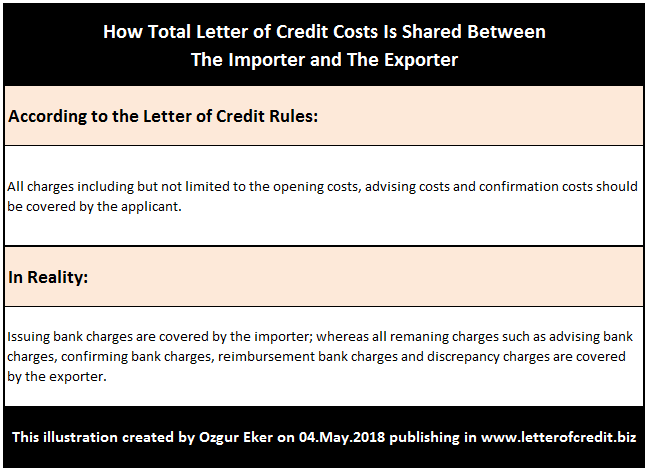 How Letter of Credit Charges are Shared Between the Importer and the Exporter: How total letter of credit cost is shared between the importer and exporter may differ from one letter of credit to another. Example: A German food importer wants to import cacao from Ivory Coast via an at sight letter of credit. The German importer applies his bank, which is Deutsche Bank, to open a letter of credit in favor of the exporter. Deutsche Bank’s import letter of credit issuance cost can be found on this document. Letter of credit amount is 100.000 Euro and the time between the issuance of the letter of credit and the payment to the exporter is 3 months. The letter of credit is issued in irrevocable format and all fees outside of the Germany will be paid by the exporter.